Sooner or later, everyone hits a ceiling on their improvement – a limit to your growth. But like with everything else, this too can be beaten by switching up the way you exercise. A lot of people search for the right exercises, but the truth is, you already know them, you just need to find a way to do them so that they’d still bring improvement. Do a flat-bench press for strength and size with the heaviest weight appropriate. Follow up with an incline press for similar effects, but this exercise also puts stress on your upper pectoral muscles, which most people ignore a bit too much. After that, do 1-2 flye exercises which will hit your outer pecs and make your chest a bit wider. Switch between incline flyes and the flat-bench presses to hit all the muscles in your chest. That’s about it. These three steps will take you to an awesomely developed chest as long as you follow them in any variant not too different from the original. However, since the details make up a lot of the efficiency of this routine, we’ll need to take a closer look so you know what you’re up against. The template for building chest muscles needs two presses and two flyes, out of which one will be flat and one will be inclined, according to movement. This way, you will be able to create three different routines that will serve different causes. The first would start with presses and following up with flyes, while the second one would put the presses between some flat dumbbell flyes. In this routine, you’d have to pre-exhaust your muscles in the beginning and post-exhaust them in the end. There is also a third routine useful for pre-exhausting your pecs – both flyes before your presses. 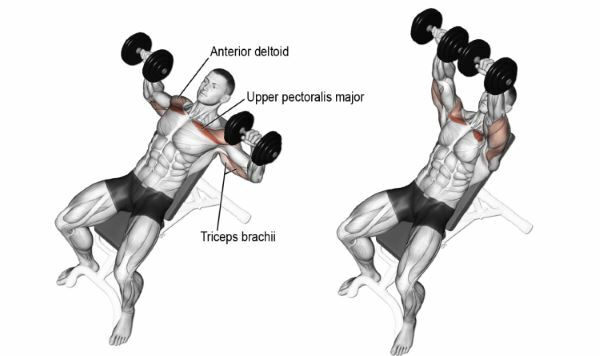 The incline dumbbell press serves to develop your upper chest muscles. To perform it, lie on your back on an incline bench on a 30 or 45 degree angle with two dumbbells over your upper pectoral region. Extend your arms and lower the dumbbells down until they’re near your shoulders. Press up and extend your elbows, but don’t lock them out. When you press up, don’t allow your weights to move forward. When you get to the top of the movement, the dumbbells should be right over your collarbones. If you can’t do these for some reason, try the incline barbell press, hammer strength incline press or selectorized machine incline press. The flat-bench dumbbell press serves to develop all your chest muscles, especially the ones in the middle. To perform it, lie on your back on a flat bench with a dumbbell in each arm, just outside of your chest. Your elbows need to be bent and your palms should be facing forward. 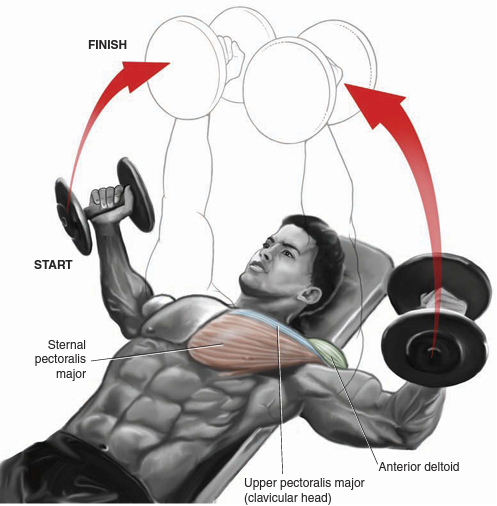 Squeeze your pectoral muscles and extend your arms, pressing the weights right up over your pecs. Your palms should continue facing forward during the entire movement. When you get to the top, don’t lock out and don’t bang your dumbbells together. Put them down and do the adequate number of reps. If you want to keep strain off your shoulder joints, make sure your upper arms and your body are at an angle between perpendicular and parallel to your body. This means that your elbows won’t be perfectly aligned, meaning they should stick out to the sides, but not perfectly. Alternatives to the flat-bench dumbbell press are the barbell bench press, hammer strength chest press and selectorized machine chest press. The incline dumbbell flye develops your outer and upper chest. To perform it, lie face-up on an incline bench with two relatively lightweight dumbbells. Hold them together over your head and make sure your palms are in and your elbows are bent, but only slightly. Lower the weight down and out to your sides until your chest starts stretching. Squeeze your pecs and return the dumbbells to their original position, and don’t forget to contract and squeeze your chest at the top. You can vary the bench incline from one workout to another, or even between sets in a single workout, to hit the chest muscle from different angles while making sure your upper pecs still bear the brunt. Do your first set at 45 degrees and then lower the bench by a notch with every set. When it gets to a notch above flat, move on to the next exercise. Alternative exercises are the low-pulley cable crossover and the incline cable flye, both of which also hit your inner pecs due to the nice and constant tension. The flat-bench dumbbell flye hits the outer and middle parts of the chest. Lie on your back on a flat bench with two dumbbells in your hands, held with a neutral grip. Extend your arms above your pecs and bend your elbows just a bit. Lower the dumbbells slowly in a wide parabola to the sides, and make sure that your elbows don’t move from that slightly bent position throughout the exercise. When you feel your chest stretching, stop and contract your chest muscles to return to the beginning of the movement. If you want to intensify the activity in your inner pectoral region, rotate your wrists so that your palms are turned toward you at the top of each rep. This is called supinating. Also, you may want to squeeze your pecs together for a second or two when you get to the top. Alternatives to this exercise are the flat-bench cable flye, the machine flye, the pec deck and cable crossover, but these exercises also activate the inner pecs because of the constant pull that cables and machines give you. So, with all that in mind, here are the three chest workouts you’ll want to try in order to spruce up your chest. Do them in the listed order over the course of the next three chest days. If you don’t want to do all three, pick your favorite and do that one as your chest training. Note that all the dumbbell exercises in this routine can be switched out with the appropriate cable, barbell or machine exercise as long as they hit the same muscles. Incline Dumbbell Press: 4 sets, 8 reps each. 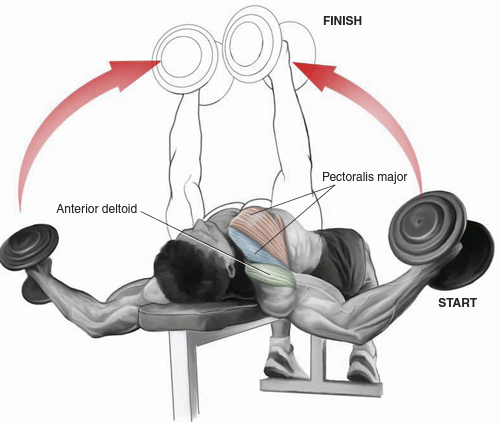 Flat-Bench Dumbbell Press: 4 set, 10 reps each. Incline Dumbbell Flye: 3 sets, 12 reps each. Flat-Bench Dumbbell Flye: 3 sets, 15 reps each. Flat-Bench Dumbbell Flye: 2 sets, 15 reps each. Flat-Bench Dumbbell Press: 4 sets, 6-8 reps each. Incline Dumbbell Flye: 3 sets, 12-15 reps each. Flat-Bench Dumbbell Flye: dropset with 8-10 reps each. – Start this exercise with a weight that will let you lift it 8-10 times at most. Go to muscle failure with it and then put the dumbbells down and take the following lighter set. Keep following the rack and getting to lighter and lighter weights until you go to full exhaustion with the lightest dumbbells. Incline Dumbbell Flye: 4 sets and 12-15 reps each, superset with incline dumbbell press for 4 sets, 8 reps each. Flat-Bench Dumbbell Flye: 4 sets, 12-15 reps each, superset with flat-bench dumbbell press for 4 sets, 8-10 reps each.